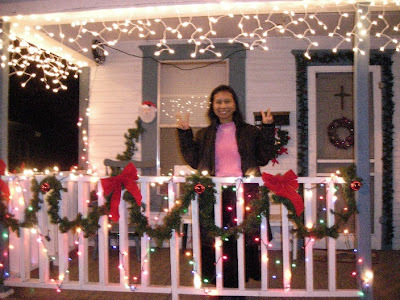 Hubby took these photos last night right after we came home from the Church's Christmas Banquet. I asked him to take photos in our front porch. 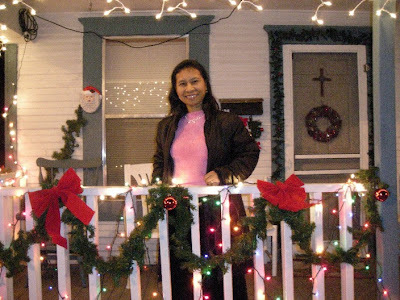 I just want to capture in picture the Christmas decorations that we put in our porch. The pics didn't really turn out that good. It's kinda blurry but still I wanted to post it here. The battery of my digicam was exhausted that's why. I would just take other pics next time. Anyways, after we had put up our Christmas tree and also those lights and ornaments at our front porch, I can say that I really feel now the spirit of Christmas. Last night we got a gift from our church, a beautiful Christmas card with a Christmas songs CD. I just love listening to it. Lisa, I love the lights in your house. It does bring out the xmas spirit doesn't it? kanindot kayo sa imong porch gyd.